The Rubbermaid 1978082 multi-purpose 1 gallon pitcher boasts a lid that locks into three different positions: open, closed, and slotted. Its wide, open top allows for easy cleaning and pouring. When the lid is used in the slotted position, it functions as an ice guard for mess-free pouring every time! Its clear design lets you see at a glance when it's time to refill. these things can take a beating. I've abused all of the ones I own, and they are strong. They don't bend or warp, don't get stained from liquids inside them, and never leak when pouring. I have purchased several of these pitchers, and for the most part they work great. You can store them on their sides in the refrigerator and they won't leak. We purchased this Rubbermaid 1 gallon pitcher to store and serve cold brew coffee in our cafe. These pitchers are very sturdy and can be easily cleaned. Also fits into the fridge just fine. I love these pitchers. The logical thing to use these for is drinks, but we actually use these to hold our salsas & dressings to easily fill our containers. I love using this pitcher for all my dry seasonings! They pour out so seamlessly, creating less mess & saves so much space. They are also very easy to clean. The pitcher is also very versatile and can be used for several things such as, pouring water & sanitizer in small/hard to reach areas. this pitcher is great quality, thick sturdy, and a good size. Lid fits perfectly so it stays on. This item is definitely something i would recommend! Finally a decent drink pitcher for my Baristas! Turning lid snaps into locked position to reduce spillage and waste. Easy to clean and sanitize to remove odd odors from previous liquids. We use these pitchers to hold iced tea and iced coffee. One gallon is the perfect size to hold a 96 oz caraffe. You can also write the date and contents on the lid with a chalk marker and it easily wipes off without getting runny. Simply well-made. Gets the job done. Attractive, as far as something simple like this goes. We bought a few and have had no problems with them. Would buy again. These gallon pitchers are a great addition to any kitchen. Used for juice, iced coffee, or water, they are worth the money- Highly recommend. Thick plastic. 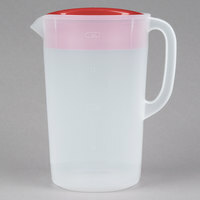 This Rubbermaid 1978082 1 Gallon Plastic Pitcher with Lid seems adequate for intended use. But, 1 gallon capacity seems a bit overstated - you'd have to fill it to the brim to measure a gallon and this proves problematic when using the lid. This is a perfect pitcher for my tea drinking family. Boiling water poured over tea bags doesn't hurt the pitcher or result in any "plastic smells." The straining lid fits snugly and prevents any ice from rushing our during a pour. Clean up is very easy with a soapy sponge and water. This is a great pitcher. It's large enough to store large batches of tea or even water in the fridge to keep cool. Lasts forever! We brew a lot of iced tea in our cafe. We love these. They are a good size, they are easy to serve from, and they hold up well. If you run a coffee shop or cafe, and are making large amounts of iced coffee, tea, juice, etc. then these pitchers are for you. They hold an entire gallon with ease, and the seal created by the lid is surprisingly tight. I love this pitcher so much. It's taken quite a beating as I've used it a lot for various drinks. It washes easily and the dishwasher doesn't destroy it. This is a nice large pitcher. I can fit a double batch of sangria in here, with all the fruit. Also, it fits in the side door of my fridge. I didn't notice any staining of the plastic from the red wine, and no residual odor left in the plastic. This Rubbermaid pictcher is great for home use. I use it for sweet tea and it's held up great. The plastic hasn't discolored and I've had it a while. These are nice pitchers. They hold a ton of liquid and are very durable. They store nicely in the fridge. We use it for tea. One of our most used items! We use these pitchers for everything from smoothie mix, to iced tea, prepped simple syrup, etc. They are durable, easy to clean, and universal because of their size. Great product and that's held up very well. The cap provides a great deal with no leaks when pouring. There's even measuring dots along the pitcher! Nice large one gallon pitcher. Great for making a variety of drinks. During something summer time they come in handy. Highly recommend for a sturdy pitcher. Excellent quality. Use these everyday and after being washed so many times, these pitchers still look new. Only bad thing is that the lid sometimes pops off if its not pushed down securely. We needed an made in the USA product that is BPA free for one of our exacting clients. This pitcher is sturdy and the top is secure so we don't need to panic about spills. These are good for keeping prepped mixes in. I do wish that they made a bigger one but this will have to do until then. These pitchers are strong and sturdy. They don't bend with filled with liquid, and after getting slammed on the counter after repeated uses, they still hold they shape very well! Only complaint is that they should have a twist lock lid. These pitchers work perfectly for what i need. I bought two of them. One for sweet and one for unsweetened tea. They are very sturdy. Very pleased with them. This is absolutely perfect for iced coffee at work. We recently got a large brewer from Webstaurant and we wanted to have the option to keep some coffee cold to use for the office to have iced coffee. This is just the ticket. It stores more than enough coffee and is easy to use and keep clean. I am actually thinking about buying another one of these for my home. The pitchers are exactly as described and the high quality you would expect from any rubbermaid product. The lid fits snug so it doesn't spill either! As other reviewers have mentioned, these lids do stay on, with little leakage, so that's the best thing about these jugs. We use them for bloody mary mix and orange juice. They aren't cheap, but are much higher quality than some of the other options out there. I love this pitcher for pouring sanitizer solution in our ice cream batch freezer. It pours well and is quite sturdy, so I think it will last for a long time. A pitcher is a necessity in most kitchens now a days. Even at home. I was looking for something for my tea at home and came across these. I have been using them for a week now and they are perfect. Except one thing the lid does not stay in the pitcher when pouring drinks. I'm always holding the lid instead of the cup. It should be the other way around. I'm not sure if it is just the lot of pitchers from the manufacturer of just a design flaw. But other than these problems I will recommend it. These are wonderful pitchers. They are of a large size and are well made. Not to mention the price was right. Such a great value! This order arrived on time as stated. It was exactly what was ordered. There were no issues on the product. We appreciate the quick response. They are what they are. Great and sturdy and perfect for your ice tea or prep or whatever you need. We have about ten of these. We use these for mixing our jouices in the bar, easy to handle, sturdy for the dish machine, great price, storage with less space taken up! This is a durable pitcher with strong walls and large handle for easy grip. It fits 1 gallon perfectly as our airpot holds 1 gallon which we transfer into this pitcher for chilling coffee. Great quality pitcher. The plastic is much thicker than those cheap ones from chain retailers. It is a big enough size to hold a good gallon of liquid. THIS IS A GREAT PITCHER, IT INCLUDES THE LID AND HAS GOOD PRICE. I USE IT FOR SERVE ORANGE JUICE, CRANBERRY JUICE, MARACUYA JUICE AND APPLE JUICE. Fantastic product. It holds up to a gallon of your preferred beverage. It is easy to handle and even easier to use. The lid prevents spillage and keeps your beverage at a desire temperature. Good sized plastic pitcher with lid by rubber maid. It is well made and the lid goes on pretty firmly so that you don't have to worry about it falling off easily. Sturdy and durable, I have used this pitcher at home for a number years. It holds up well to dishwashing. Handle is strong and doesn't feel like it will break off as it can with cheaper pitchers. Stronger and more durable than expected. We use this to make tea and iced coffee and so far so good. Buying more right now! Great product. This pitcher works great for storing liquids but it would be an even better product if there was a way to lock the lid on. Needed some one gallon pitchers and these worked. Found out they are the same price as local stores, but still a good item for the price paid. Great for beverages with ice! Easy to fill and quickly refill. Durable and easily maintainable! Great bargain. Excellent for banquets and even diners. Works well for iced tea and water! Very nice pitcher for holding beverages. We also use them for shaking sauces on chicken wings and other food items and the lid stays on and does not leak.